Arlington is home to some die hard burger fans, and Jason is one of them. Nikki and Jason took an adventure around town trying everyone’s favorites and cultivating a few new favorites of our own for our new and official Vlog series to be continued. Take it from us, it was hard to narrow it down but here are our top three burgers. About a mile and a half away from the Entertainment District, Tom’s Burgers is a privately owned and operated burger establishment that reps a 50s throwback vibe and some serious deliciousness. They use Nolan Ryan’s All-American Beef, and there are TWO within very close driving distance to the Entertainment district. 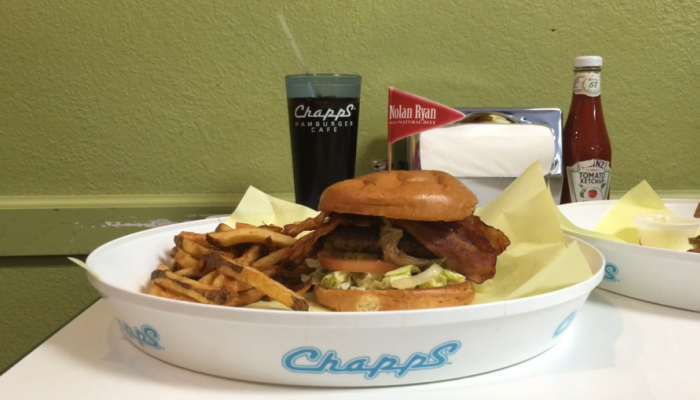 They’re known for their self-titled “Chapps Burger” and we cannot complain about the Turkey Burger, which was incredibly yummy! If you’re from North Arlington or the surrounding area, you frequent Al’s on a pretty regular basis. Right down Highway 157 almost on the border of Fort Worth-Euless, Al’s and their delicious homemade burgers are there to fill you up and leave you happy. A neighborhood staple that stuck around, we suggest going all out and adding zesty jalapeno bacon to your burger.